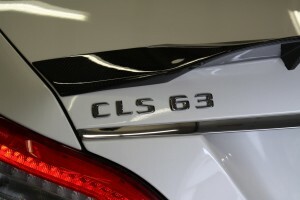 This week in the shop we had the pleasure of working on a client’s 2014 Mercedes CLS AMG. 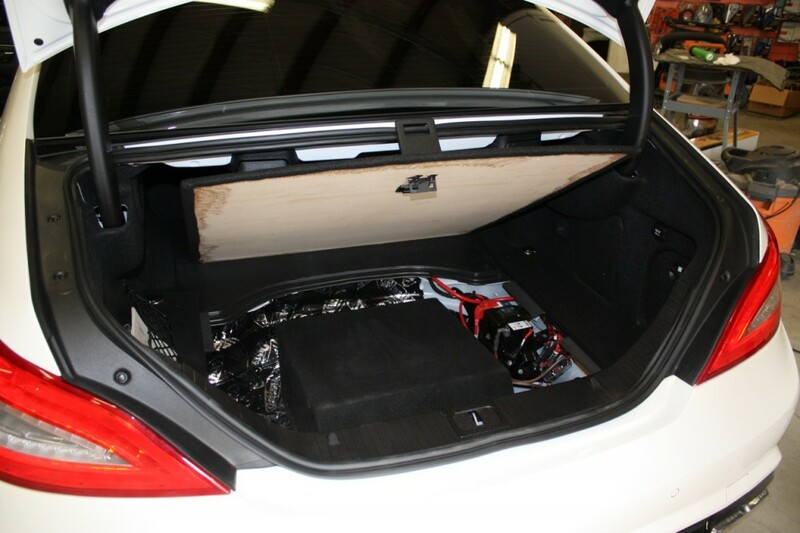 For this vehicle, our task was to install both a K40 radar and laser system as well as fabricate a stealth custom subwoofer enclosure. 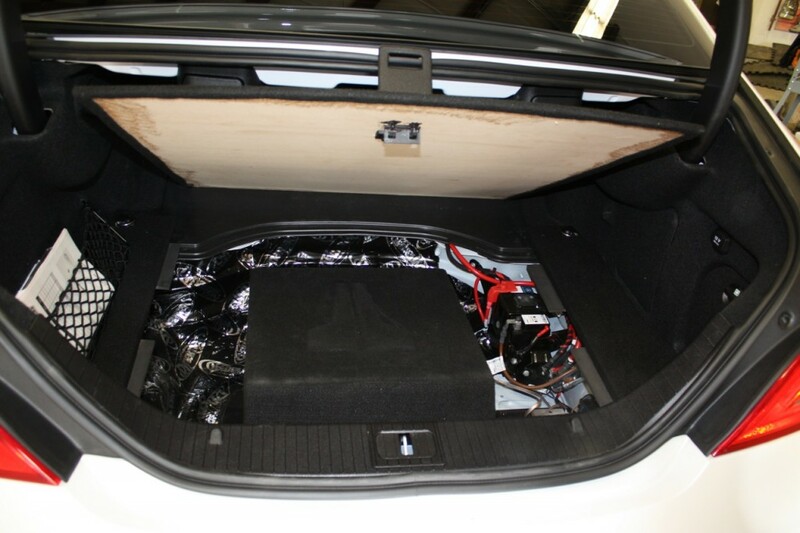 We had previously installed a JL Audio amp and subwoofer over the Winter, however the enclosure was pretty big and took up a large portion of the trunk. Like most consumers, this client wanted the benefits of an amp and sub, but he didn’t really want to see it. K40 radar and laser systems are usually pretty stealth as it is, but for this particular Mercedes we took integration and stealthiness to the next level by installing a Mid City Engineering K40 instrument cluster interface. 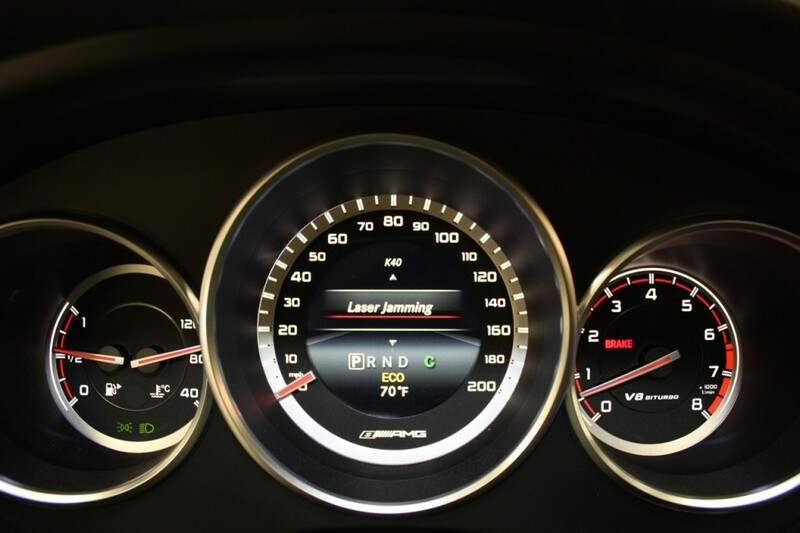 This interface eliminates the need for the K40 LED indicator lights and instead displays warnings in the instrument cluster of the vehicle. Aside from the K40 system and stealth custom sub install, we had one other task to accomplish. We planned to do a frequency sweep to investigate an inherent rattle that was baffling Mercedes engineers. Prior to us working on this vehicle, the client had been experiencing an annoying and inconsistent rattle coming from the rear shelf. After several failed attempts to identify and eliminate this rattle, the dealership called in Mercedes engineers who also failed to identify and repair the problem. A frequency sweep would be the easiest way to reproduce the rattle, identify where it was coming from and then repair it. John focused on the K40 installation first. We sell and install and lot of K40 systems at our shop. 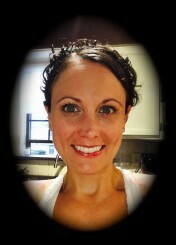 There are several combined reasons for why we love the K40 systems. 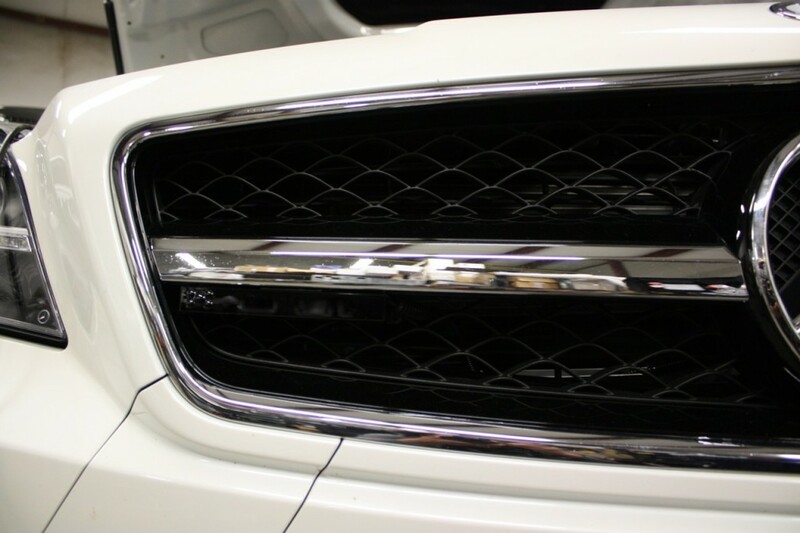 Exterior discreetness will be the same from brand to brand as most companies have radar receivers that can be hidden behind bumpers and laser shifters that are small enough to be blended into the vehicle’s front grill. When you step back from the vehicle you really can’t see the left and right laser shifters. They really kind of blend into the front grill. The coolest part about this install is what you see inside. Normally with K40 you have two small LED indicator lights as your display. One indicates for front, one indicates for rear. Additionally, there is a hidden speaker that announces the alerts and a wireless remote control to change settings and turn the system on and off. For an even more discreet and integrated installation, we installed a Mid City Engineering K40 instrument cluster interface. Check out how freaking cool this is. No LED’s are needed with this setup, your display is right in front of you integrated into your factory instrument cluster. Mid City Engineering has a few different models listed on their website, but give them a call if you don’t see your application listed. Check out this trunk. 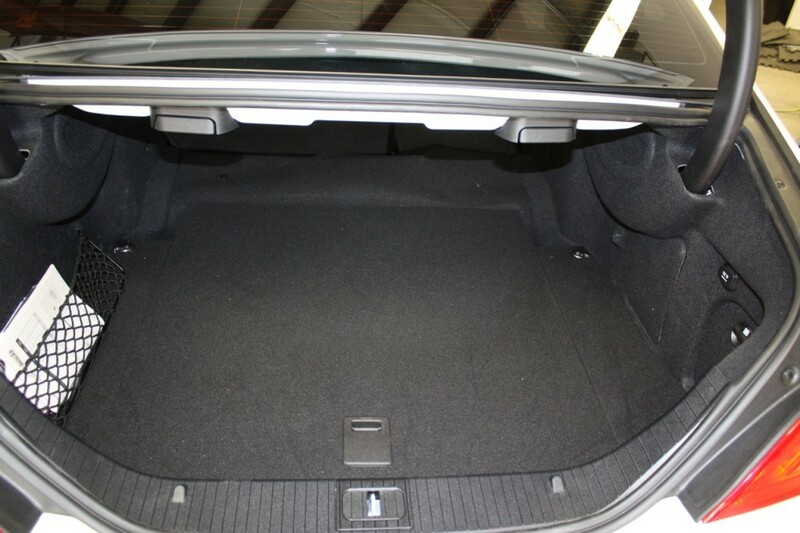 Would you believe we’ve got a 12″ W6V3 subwoofer enclosure in there? Disclaimer – We did sacrifice the inflate a spare to accomplish this. 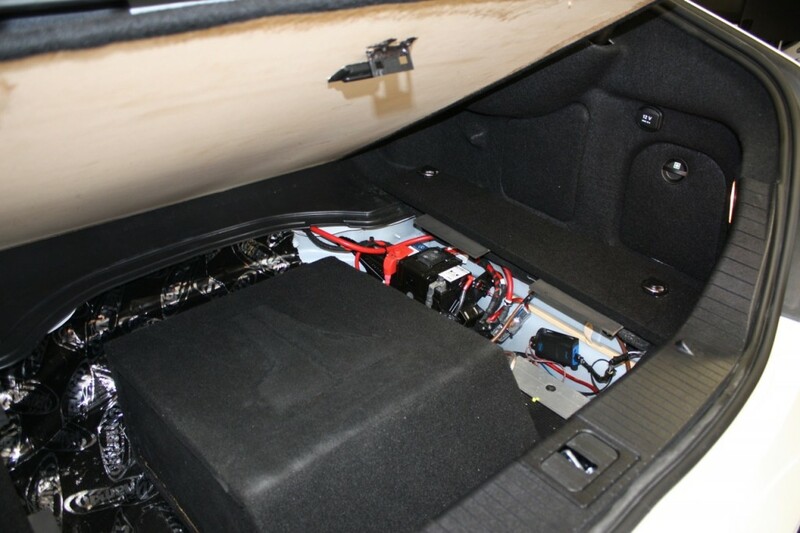 John built a down-firing sealed enclosure for the 12W6V3 and remade the entire trunk floor as it needed to be raised up 3/4″. 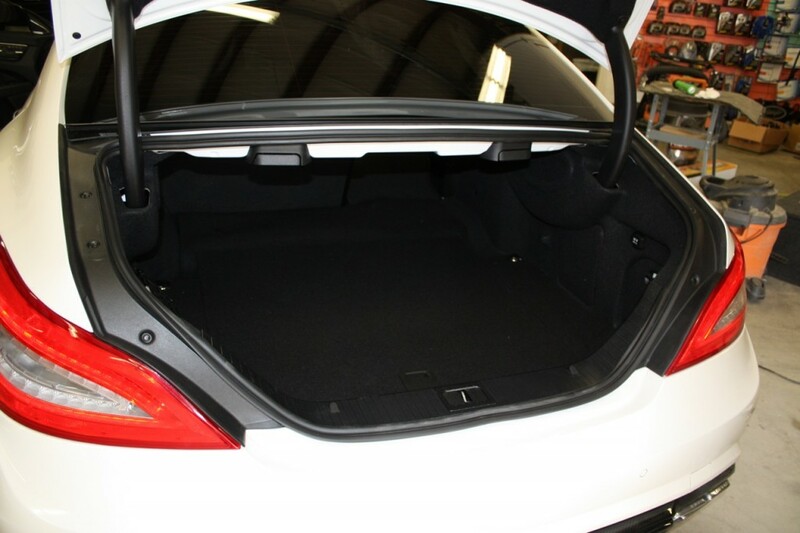 He removed the factory hardware from the original trunk-liner and attached it to his newly fabricated trunk-liner. He also dynamatted the entire trunk well while he was in there. The JL symbol on the top of the box is a foam inlay he made before carpeting the enclosure. Whenever adding an amp and subwoofer to a factory installed audio system, it’s always a good idea to install a bass knob or subwoofer control knob. 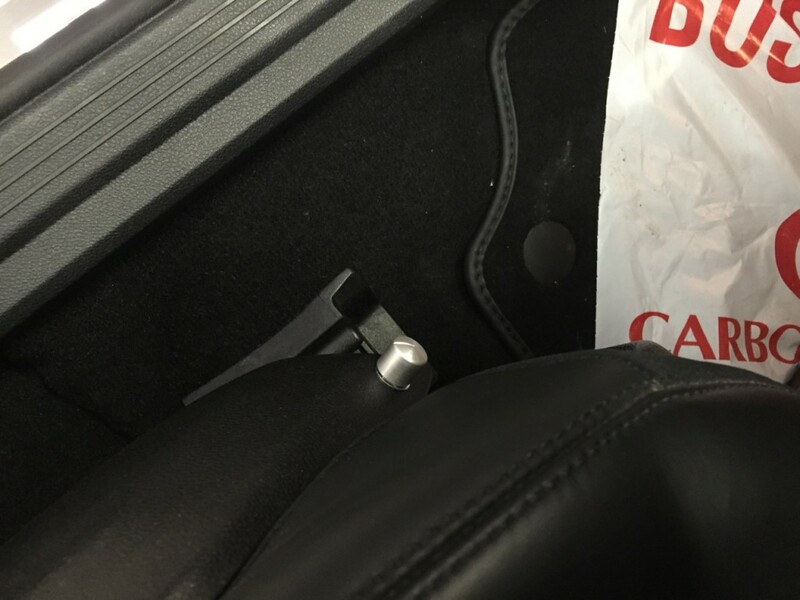 In this particular vehicle, John mounted it towards the bottom left side of the driver’s seat panel. It’s discreet, yet easy to access. To identify the rattle that eluded Mercedes engineers, John played a frequency sweep and then listened and located the rattle in the rear shelf. The culprit was a control box mounted on top of the deck lid bolted from the bottom. Even though it was securely mounted, it needed sound dampening material underneath it. 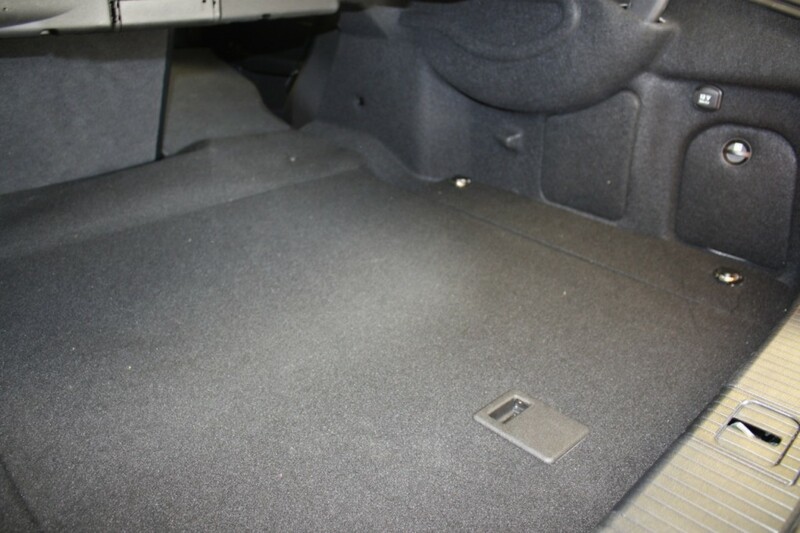 This was a thorough and meticulous installation designed to be discreet without sacrificing performance. This vehicle now sounds fantastic and has the added benefit of radar and laser protection, yet you’d never know it from appearances. If you’re in the vicinity of Brookfield, CT (Fairfield County) and in need of a polished and discreet installation for your vehicle, contact us today to see what options are available.